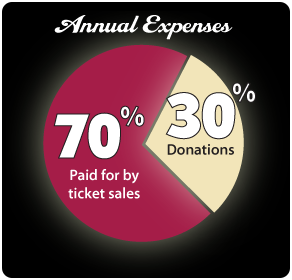 Why Donate to Plaza Theatre Company? Plaza Theatre Company opening in 2006 has become, in just a few years, a destination for live family entertainment in North Texas. We've presented over 70 live productions, have over 1,150 Season Ticket Holders and over 70,000 patrons, Plaza is truly an exciting meeting place to meet for family, actors, volunteers, neighbors and friends. "Our mission at Plaza Theatre Company has always been to deliver the highest possible family musicals and comedies at the most affordable prices. To us, famly friendly also means family affordable." Our mission at Plaza Theatre Company has always been to deliver family musicals and comedies with the highest possible quality at the most affordable prices. To us, family friendly also means family affordable. As a 501(c)(3) non-profit community theatre, Plaza Theatre Company serves its patrons with high quality productions featuring local community actors and technicians. Despite the high cost of producing live theatre, Plaza is committed to maintaining affordable ticket prices. Plaza Theatre is proud to offer a place where local community actors can enthusiastically share their talents and perform in top-notch theatrical presentations. The combination of high-quality, well-attended, affordable live theatre makes Plaza Theatre Company an exceptional community asset. In addition, Plaza Theatre offers many educational opportunities and community outreach programs through it's Plaza Academy Acting Classes and Camps. To date hundreds of young, aspiring performers have taken part in this program at a very affordable cost. "The bottom line is, to fulfill our mission at Plaza, we need your help. You can fulfill the crucial role of helping to keep these costs affordable for Plaza patrons and young performers." The bottom line is, to fulfill our mission at Plaza, we need your help. 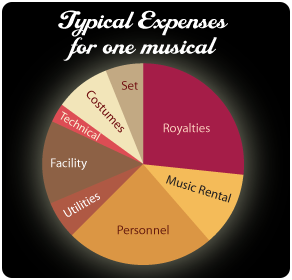 You can fulfill the crucial role of helping to keep these costs affordable for Plaza patrons and young performers. Your contribution is tax-deductible and is an excellent contribution to continued excellence in our community. Here's your cue, thank you for your consideration.